Malala Yousafzai, the 16-year-old activist shot in the head by the Taliban, is to be awarded the accolade on 6 September. The tireless campaigner and advocate of girls’ education, who survived being shot at point-blank range in her native Pakistan in October 2012, will be presented with the International Children’s Peace Prize at the Hague, Holland next Friday. The 2011 Nobel Peace Prize winner, Tawakkol Karman, will present the young activist with this honour. ‘Malala was already one of the nominees in 2011, but this year the expert committee unanimously decided not to nominate other children, but to award the International Children’s Peace Prize to Malala,’ said Marc Dullaert, chairman of the Dutch KidsRights Foundation, which awards the prize. 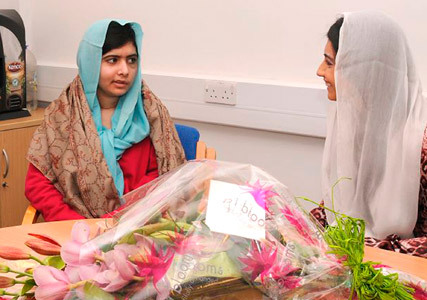 Malala underwent a successful cranial operation in February at the Queen Elizabeth Hospital Birmingham, where she now resides. We continue to be awed by this remarkable young woman.